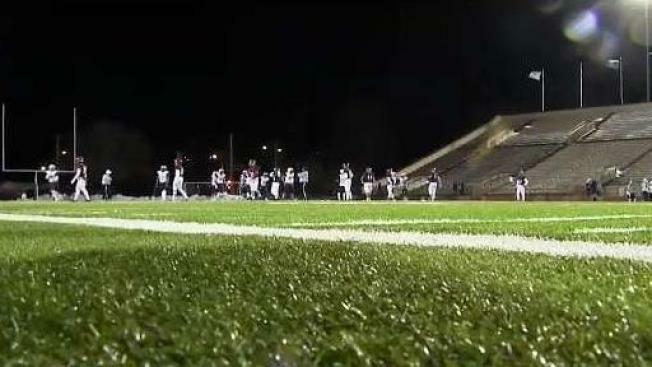 The cold is forcing high schools across New England to move their football games from Thursday to Wednesday. It was a freezing night at the Lawrence/Central Catholic football game at Veterans Memorial Stadium in Lawrence, Massachusetts. It was so bitterly cold, the Central Catholic band left at half time. The band chaperone says the kids' toes and fingers were freezing, and it was getting too dangerous. The Thanksgiving temperatures are expected to be even more extreme. That's the reason why the game was moved a day early to Wednesday night. "My daughter is a senior on the cheerleading team, so at least I won't be freezing tomorrow morning on the field," said Jeanne Zahn. "I think if the kids could be hurt by the cold weather, it's OK to move the game," said another parent, Karen Cabral. Whether the game was Wednesday or Thanksgiving, George Howsham wasn't missing his grandson's big senior game. Howsham was dressed in thermals and three coats, and he brought a bag of blankets. "I like it. Tomorrow would have been brutal. Zero degrees with the windchill factor," Howsham said. The players were also wearing Underarmour and trying to keep warm when they weren't on the field. Lawrence freshman coach Anibal Garcia says the time shift is bittersweet, but he supports it. "I'd rather have it on Thanksgiving when I was a senior," he said. "I was hoping to have it on Thanksgiving, but things change for the safety of the kids."